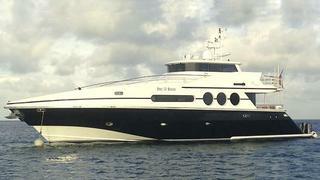 26 North Yacht Sales send word that they've signed the 26.52m motor yacht Bac O Booc for sale. Built by Oceanfast in 2000, her expansive interior by Sam Sorgiovanni accommodates up to 10 guests in four staterooms and twin 1145hp MTU engines give her a cruising speed of 13 knots. Bac O Booc has a spacious full beam saloon with large windows on three sides flooding her with daylight and her formal dining area has seating for 10. A thorough refit in 2010 included a full repaint of hull and superstructure and the installation of LED lighting throughout. Lying in West Palm Beach, Bac O Booc is asking $2,549,000.